Create amazing 3D designs, right on your iPad! 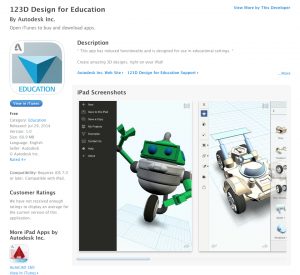 With Autodesk 123D Design for Education what you design is up to you. * Get started by choosing one of the basic shapes and then edit it to be just what you want. * Easily connect one shape to another to make more detailed designs. Objects snap naturally to the centers of faces. * The included parts and example projects are a fun way to play around with design ideas or get acclimated to design concepts. * Chose from one of the example kits and start building. Each part is editable so you can try out different ideas and make them your own.